After acquiring Tyler Johnson in a trade with the Miami Heat two days ago, the newest member of the Phoenix Suns was set to make his debut against the Golden State Warriors on Friday night. The Suns were without their two leading scorers in Devin Booker (hamstring tightness) and T.J. Warren (ankle soreness) as well as De’Anthony Melton (ankle sprain) and went with a starting lineup of Elie Okobo, Josh Jackson, Mikal Bridges, Dragan Bender and Deandre Ayton for a second straight game. It only took a few minutes into the game for that lineup to catch fire and start dominating the defending champions. Jackson made a layup followed by a three-pointer and the team began to take-off (both figuratively and literally with some high-flying dunks). Led by Ayton’s 10 points, the Suns went on a 21-to-2 run and took a 17-point lead midway through the first quarter. The Warriors aren’t a team that usually is down for long and Friday wasn’t any different as they battled back into the game to tie it in the second and take a seven-point lead at halftime. The Warriors were hot, but the Suns were on a mission to prove that they could hang with one of the top teams in the league. Through defense, transition and battling on the glass, the Suns outscored the Warriors 32-22 in the third quarter and went up by three with just 12 minutes to go. For the most part, the Suns had held the two-time MVP Stephen Curry relatively quiet, but that didn’t hold him back from trying to find his shot. And in the fourth quarter, he found it. The Suns led the first four minutes of the final quarter, but Curry began to take over. He scored 10 points in the fourth as he and Klay Thompson closed out the game with a 117-107 victory over the Suns. While the Suns seemed to just run out of energy at the end of the game, they still had an overall impressive performance against the defending champs, despite missing three of their usual starters. They showed their hustle throughout the night holding both the rebound and steal advantages against the Warriors. Kelly Oubre Jr. notched a double-double with a career-high 12 rebounds to go along with his 25 points, four assists and three steals. Oubre has now scored in double-digits in 16 straight games and is averaging 18.2 points, 5.7 rebounds, 1.6 steals and 1.1 blocks throughout that span. 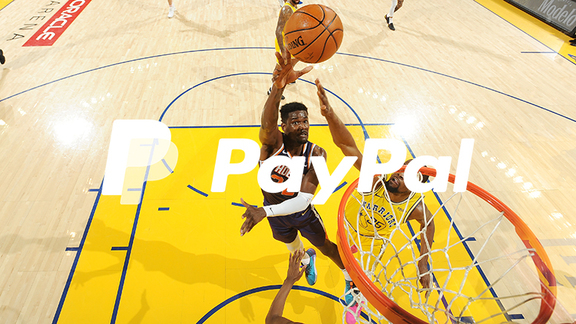 Ayton notched his rookie-leading 30th double-double of the season as he scored 23 points to go along with his 12 rebounds, three assists and one block. While Tyler Johnson may not have had a stellar shooting night, he still gave Suns fans a glimpse of what he is capable of with five points, two assists and two steals in his Suns debut. The Suns hit the road as they travel to Sacramento to face the Kings on Sunday. Be sure to catch the action on Fox Sports Arizona.